It’s so rare that anything happens with Jack’s Bar, that I just had to post this picture. They’ve boarded up the windows, and painted the plywood and trim a pale green. Not too exciting, I know, but when literally nothing has happened here for years, you grab on to what you can. Jack’s Bar says it’s been a saloon “Since 1859”, but really it only dates back to 1899. One day about six or seven years ago, the owner left for a month-long vacation, and never came back. The property was sold to the owners of the Ormsby House, and they’ve said they’re not going to do anything with it until the Hotel/Casino project across the street is finished. Which means that many of us won’t live long enough to see Jack’s Bar renovated. The building is made out of the same sandstone blocks as the Capitol and the Mint, but it’s not in such good shape. There is an obvious tilt to the south wall, and the entryway hasn’t been square for decades. The owners have tossed around the idea of demolition, but were met with resistance. So they’ve decided to just let the property rot for a few more years, maybe hoping it will fall down on its own. 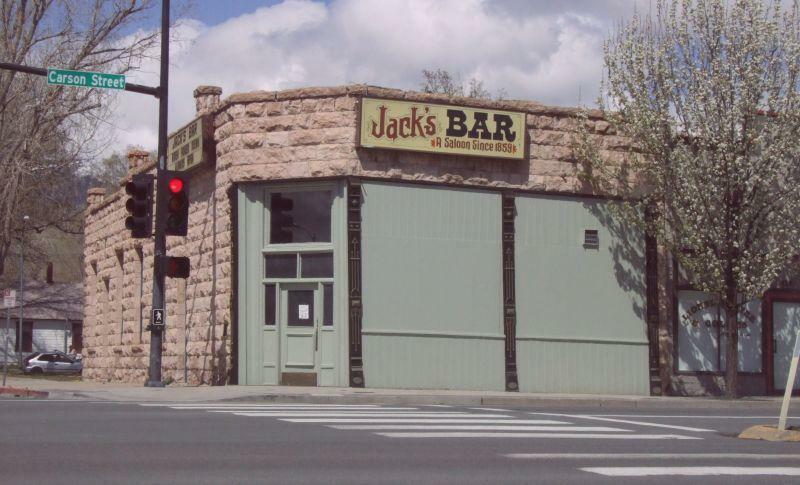 Maybe one year Jack’s Bar will rise again, but for now at least it has a fresh coat of paint.